We visited our Shepherdstown family from Thursday until yesterday. It is always good to see our Eastern Panhandle family. We were getting ready to leave when I noticed the handmade railing leading up to the park located across from John and Rachael's house. Shepherdstown is a town with many artists and one talented person crafted this unique railing. I heard this little voice behind me. "Grandpa, what are you doing?" I said that I was taking a photo but I really needed a model to improve upon my photographic skills. Flora quickly positioned herself slong the steps. I do not think I could find a cuter model. What do you think? After our photo shoot, Flora went up the steps and starting climbing on the monkey bars. I could easily have shown her several moves on this equipment, but I certainly did not want this 61 year old granddad to outshine Flora!. 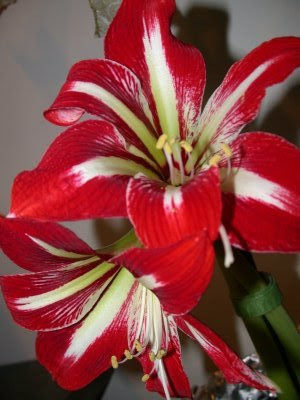 The modern bulb most commonly known and sold as the Amaryllis is really a Hippeastrum. This cumbersome name has been rejected by bulb growers, and in retail stores you will not see colorful boxes labeled in large letters with the appellation Hippeastrum. The Amaryllis name usually refers to the Amaryllis Belladonna, one of the progenitors of the current Hippeastrum crop imported by Dutch growers. The major Dutch breeders have spent the last two centuries hybridizing these specimens to bring us the flower we know and love. Today's cultivars have stalks ranging from about 12" to 24" with each stalk having four to six flowers. Typically, a bulb will produce two stalks in a blooming season. With care, these bulbs will bloom every year for many years. On Friday we decided to eat our lunch at Bon Appetit. I told you guys about this great cajun restaurant in downtown Clarksburg. We arrived around 2 P.M. and was told they were closing early because they were catering 150 folks for a Christmas party. I am happy that they are finding success. Hope the business continues to grow since they have excellent and resonable meals. I am including portions of the AP article that was printed in the Charleton Gazette on Saturday. CLARKSBURG, W.Va. -- It's midmorning at Bon Appetit, and the beignets are long gone. Behind a Plexiglas wall, a cook is chopping vegetables for lunch. Music heavy with brass is blaring, and Chef LeRoy Crump Jr. is rushing about with cell phone in hand, periodically stepping outdoors to greet a passer-by and tout the special, a Cajun shrimp cream pasta. 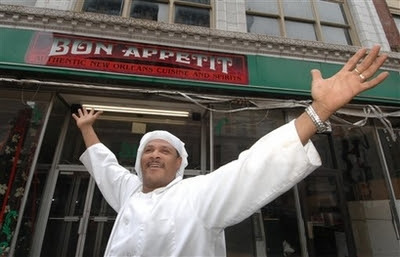 The sign above his 2-week-old restaurant promises "Authentic New Orleans Cuisine and Spirits" - in small-town West Virginia, 1,000 miles from the French Quarter. 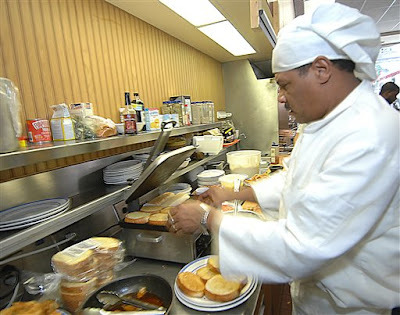 After Hurricane Katrina destroyed his New Orleans home and restaurant, Crump traveled to Atlanta, then Daytona Beach, Fla. A chance encounter with a hotel guest who smelled Crump's cooking lured him to Clarksburg, a town of 17,000 in a state he'd barely heard of. He recalls driving through Virginia, lost in the dark. Shortly after a trooper told him he needed West Virginia, the next state over, he started seeing mountains. "I thought 'Oh my God, what have I gotten myself into?'" he remembers with a laugh. And now? "I have customers now who say 'If you ever try to leave, we will have the State Police stop you on the interstate. You will not get out of town.'" Like other displaced Mississippi and Louisiana residents, Crump has taken root in an unlikely place, bringing along the tastes of home and the ability to share them. From Nevada to West Virginia, professional and amateur chefs alike are sharing Cajun and Creole fare with folks who still consider it exotic. 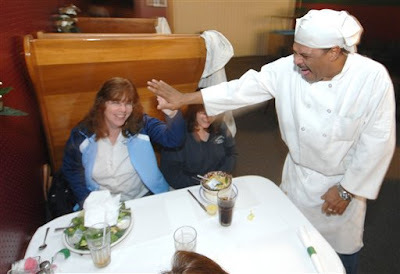 Don Jackson, the tourist Crump met while watching a shuttle launch in Florida, opened his home kitchen the day Crump arrived. Together, they cooked 40 gallons of jambalaya and seafood gumbo, loaded up an El Camino and drove around selling $2 bowls. Two weeks later, Crump met a video poker bar operator with a full kitchen. "I started letting people know I was going to open up on the corner at Ray-Ray's, and they said 'I'll be there,'" Crump recalls. "And I'll be darned, the place was packed." He quickly outgrew it, moving into a 50-seat place with a landlord who offered two months rent free. 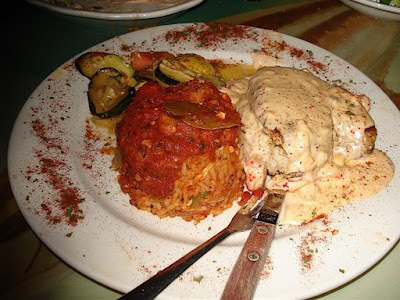 That's where Stephen McIntire ate his first bite of Cajun food, a dish of creamy red beans and rice. He became a regular, then a business partner. Together, they opened Bon Appetit, which employs 18 and can seat 500 in a former McCrory's department store. They order the mix to make beignets - a square of dough, deep fried and dusted with powdered sugar - and coffee from New Orleans' famous Cafe du Monde, and seafood from the Gulf Coast. Crump's crawfish arrive alive, and he likes to boil them in a pot on the sidewalk for all to see. "Honestly, I have lost almost 15 pounds with worry and fear, thinking 'Oh my God, is this the right thing? Are people going to come in?'" Crump says. "It was worry for naught. ... When most people leave, their bellies are full, they've got a to-go box and they're thinking 'When's the next time we can come eat?'" Merry Christmas! It is our wish that your holiday season is joyful and blessed. 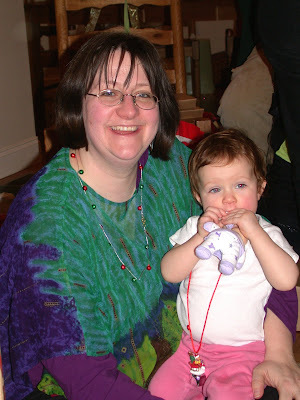 Here are a few glimpses into our Christmas. 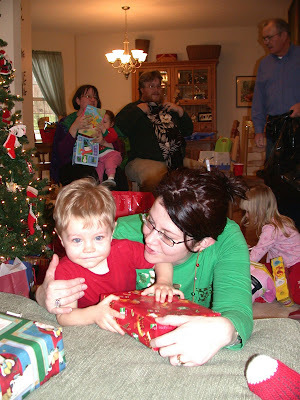 It is a mystery how an 18 month old quickly learns to open presents. Sam the Man needs no instruction from Mom Sarah! Look what Lucy received from Aunt Judy! Sister Judy knitted this wonderful sweater. Mom Rachael was so appreciative of the love and skill that went into making this gift. 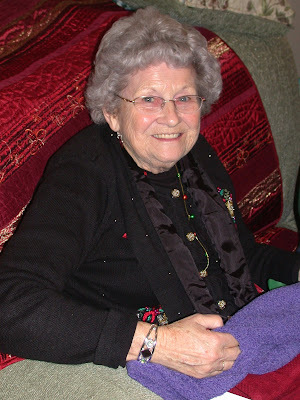 Grandma Great Meads was seated in the chair of honor and enjoyed watching the kids open their gifts. 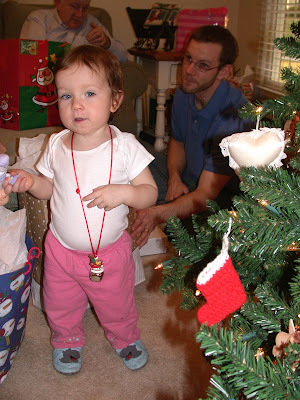 We should mention that Miss Lucy, who is now 13 months, has begun honing her walking skills. She is doing super and likes the idea of being on two legs instead of four. We had a yankee swap after the gift exchange. 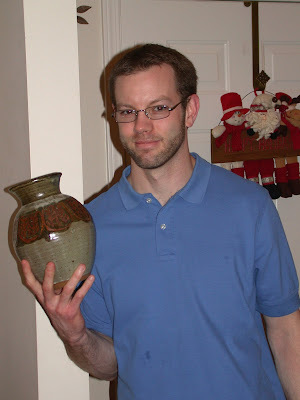 Here is Jeff with his prize. Is this Mary and Joseph? 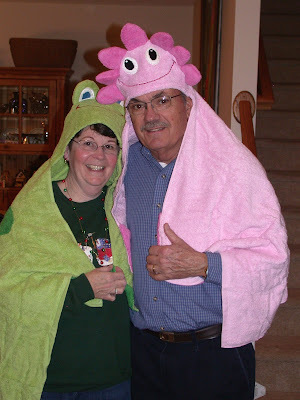 No, tis Sister Judy and husband Bill trying on the kids animal towels. 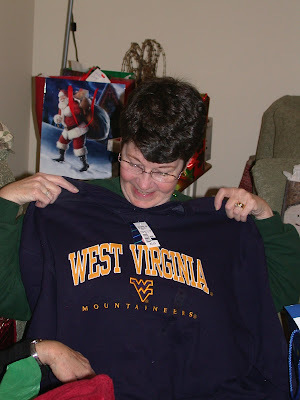 Judy is checking out her WVU sweatshirt. The shirt was a gift from Jeff and Sarah. Jeff and Sarah will be leaving in a few days for the Feista Bowl. Since Coach Rod left WVU to go to Michigan, there has been quite a public outcry over what has transpired with the WVU coaching staff. Jeff has 4 extra tickets to the game. Anyone interested? Grandma and Flora are showing to all the photo of Leslie's wedding. Flora was Leslie's flower girl and this photo was a gift to Grandma. 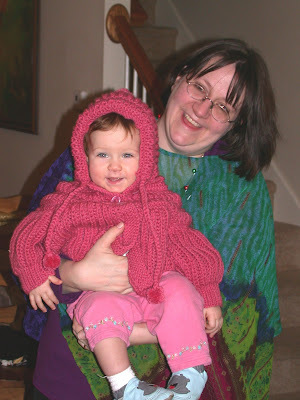 When Leslie was a student at Shepherd University, she was Flora's baby sitter. We wish you the very best Merry Christmas season from the Meads family! 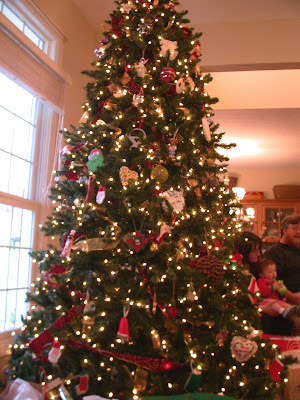 Well, we celebrated Christmas with the kids and grandkids this weekend. Sam decided that he would be the Santa for the holidays. Sam loves to spin. Mom and Dad often spins him around and he responds with sounds of giggling and often belly laughs. Grandma and grandpa remembered the ole Sit-n spin that we had for our girls in the 70's. Off to Toys-are-us - we found they still are selling this spinning toy. The toy was not the quality of the original but still had the same effect. They have added music and voice controls that we tried to turn off. Sam quickly discovered the off-on switch! 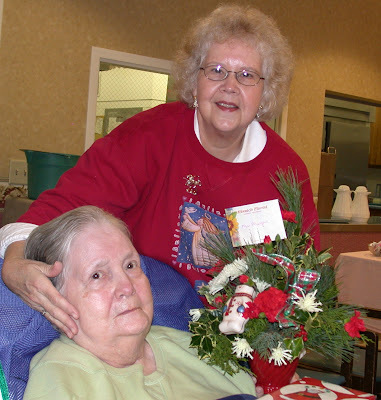 Another Miracle for Judy of Assisi! Remember my explanation of how the wonderful wife can save birds by touching and whispering gently to them? (She was a bird whisperer way before the horse whisperer became into prominence.) Yesterday she proved herself once again by saving a Blue Jay that was in shock. After gentle treatment, Judy always places the birds on a cushion on the porch and 99% of the time they fly away and seem to be fully recovered. This Blue Jay had a collision with a pane of glass and was lying motionless on the ground. After only a few minutes of Judy's soft whispers and healing touches, the bird became bright eyed and alert. It flew off from its healing cushion after about 40 minutes. Twas another excellent job, Bird Woman! Here Is A Christmas Rat For Thee! We discussed the Foja area in Indonesia in a blog last year when a pethora of new species were discovered in this remote region. I thought I would share this Christmas Rat. All it needs is a red and green ribbon around its neck. 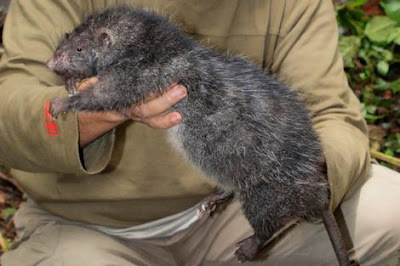 Researchers in a remote jungle in Indonesia have discovered a giant rat - five times the size of a typical city rat - and a tiny possum that are apparently new to science. Unearthing new species of mammals in the 21st century is very rare. The discoveries by a team of American and Indonesian scientists are being studied further to confirm their status. The animals were found in the Foja mountains rainforest in eastern Papua province in a June expedition, said US-based Conservation International, which organized the trip along with the Indonesian Institute of Science. "The giant rat is about five times the size of a typical city rat," said Kristofer Helgen, a scientist with the Smithsonian Institution in Washington. "With no fear of humans, it apparently came into the camp several times during the trip." The possum was described as "one of the world's smallest marsupials". Papua has some of the world's largest tracts of rainforest, but like elsewhere in Indonesia they are being ravaged by illegal logging. Scientists said last year that the Foja area was not under immediate threat, largely because it was so remote. Yes, the ole Christmas cards are rolling into our abode. 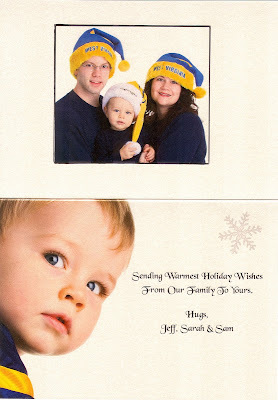 I am including this one from Sarah and Jeff (AND SAM!). 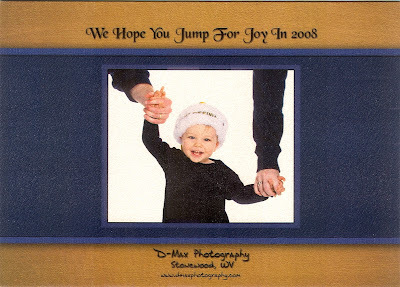 The photography folks in Stonewood did a fine job in making their cards. I am sorry we are so lax in getting cards out. We are going to have to hire a professional card secretary! 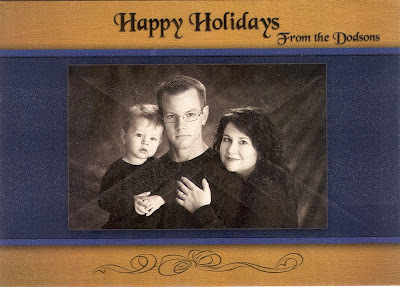 Each year we get a card from Brandon and Nichole Craft who now reside in Charleston, South Carolina. Brandon is finishing up his medical training there. Nichole gets my vote for the one we hire to address our correspondence. Nicole does wonderful (and I mean wonderful) calligraphy! Her script is perfect and straight. She is a true professional in this art. Can you believe that Christmas is only eight days away? Once again time travels at supersonic speed in this household. We have many blessings in this state. One of the things that concerns me, however, is having leaders who are sensitive in protecting our natural heritage. It is important that they have an effective plan assuring the protection our little piece of the biosphere for the future. You know how I love Dolly Sods, Spruce Knob, and the other natural areas that are within our boundaries. These unique areas are special to many folks and certainly add to our economy of our state. West Virginia recently placed 50th in a ranking of the 50 states. This ranking came from what is perhaps the nation's most respected business publication, Forbes magazine. 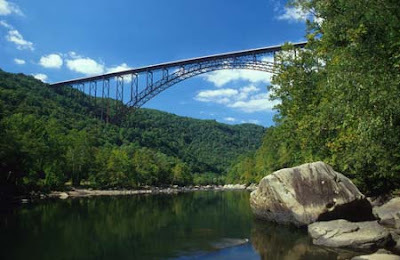 Forbes ranked West Virginia 50th - dead last - in a ranking of "green" states. The rankings appeared in the Oct. 17 issue and put Mississippi (you knew it), Louisiana, Alabama and Indiana just ahead of West Virginia. About these states, the magazine said: "All suffer from a mix of toxic waste, lots of pollution and consumption, and no clear plans to do anything about it. Expect them to remain that way." West Virginia has the highest rate of death caused by power plant pollution in the entire United States. 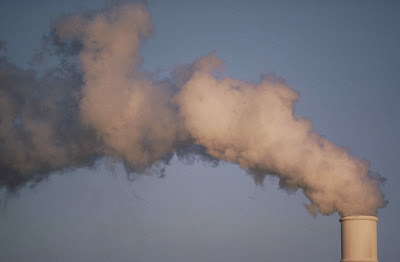 According to US Environmental Protection Agency estimates, nearly 400 West Virginians die each year from heart attacks and lung cancer caused by power plant pollution. In addition, 314 emergency room visits, 331 hospitalizations, 7923 asthma attacks, and 41,627 lost work days are estimated to result from power plant pollution in WV. I was really saddened when the WV Department of Environmental Protection recently slashed a list of West Virginia streams targeted for extra protection nearly in half. Gov. Joe Manchin has asked that 303 protected streams be reduced to 156 streams. Manchin and WV legislators, after listening to coal industry lobbyists, requested the reduction. The change will allow for several new mountaintop removal operations, where debris is used to fill in adjacent streams. The protected designation allows a minimal amount of new pollution to enter a West Virginia stream. The DEP will be submitting the new, shorter list to the Legislature in January. There has to be a compromise between our natural energy industries and environmental groups soon! Top of the morning to ya! It has been a busy and fun weekend thus far. No snow or ice storms. I mention this because ice and snow is what I have continually heard for the past several days! Friday we traveled to Elkins to meet Mom Meads, Sister Judy, and Brother-in-law Bill. We checked into the Holiday Inn Express and had a super meal at C.J. Maggies. After supper it was off to our last show for the year at the American Mountain Theater. 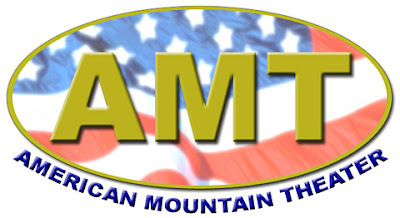 For the past month, American Mountain Theater has been presenting their Christmas show. This afternoon is the last show of their 2007 season and the theater will not reopen until February of 2008. It was a great Christmas show and we will certainly return when they open for their spring season. After the show, Judy and Bill said that they were getting up and leaving the hotel early so they will hopefully beat the heavy snow. Now Bill is a retired WV Highways employee and I wonder why he does not have the faith in his storm removing crew at the Department of Highways? Bill is the one that always says when they cross a bridge – “This was constructed by the lowest bidder”. It makes me feel really secure when I travel over the New River Gorge Bridge outside of Fayetteville. After adding to the local economy, we left Elkins at noon. No snow yet. 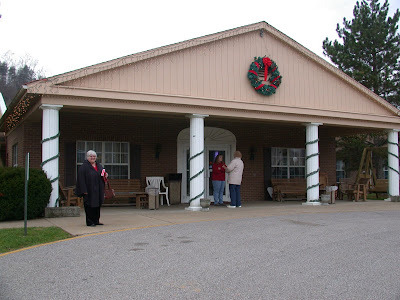 We had to be back in Glenville at 2:00 for Grandma Great Musgrave’s Christmas Party at SunBridge. We arrived back in Glenville with temperatures in the forties and no precipitation. I thought to myself that the BIG STORM must have slowed to a snail’s pace somewhere in Ohio. The Christmas party at SunBridge is always a wonderful affair. Brenda Marks and the staff do an outstanding job. 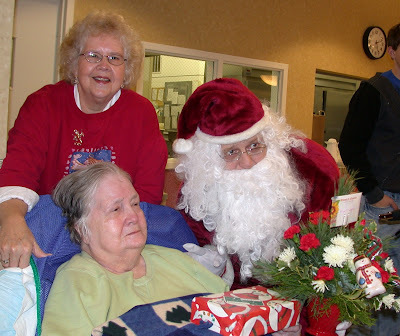 They arrange for Santa to deliver presents to all the residents. I will show you Santa and "Grandma Great In The Big Chair". Many special folks are at SunBridge. Phyllis Marks is a great lady who has performed at the Folk Festival since it began in 1950. Even though she has lost her sight, she has a great sense of humor. After receiving presents from Santa, she asked “Do you know how to get Santa unstuck from a chimney?” I said, “Nope.” Her answer was SANTAFLUSH! After the party we had about an hour to rest before the big Christmas parade in downtown Glenville. Still no snow but the sky was getting cloudy. Perhaps Judy and Bill’s big snow and ice storm has finally started moving into West Virginia. Before I leave, I must tell you that it rained most of the night. No ice nor snow event in Central West Virginia; however, the weather folks do say that temperatures will be dropping and that light snow is possible. They indicate that there will be high winds. It is still raining and the winds have picked up in speed. They have 50% of the forecast correct – not bad! Heavy rains entered the county last night and it has rained most of this day. Our little creek behind the house became a roaring waterfall. Schools sent the kids home during the early afternoon not only in Gilmer but also in the surrounding counties. The rains now have stopped. One of the areas by our house that gets flooded easily is the soccer field. As you can see from the photos below, the waters have started to cover the fences. My guess is that the water will be receeding soon. Just talked with our friend, Judy Chisler, on Skype. (If you do not know Skype, you need to download the free program at http://www.skype.com/.) She and her family are living this year in Australia. They are participating in an international medical exchange program. Judy lived next door to us as she was growing up in Glenville. I explained to Judy that we were having minor flooding and may be getting snow this weekend. She chuckled. I forgot that it is summer on that continent. She explained that her kids are now out of school for the two month summer vacation, and it is hot there. During the school year, the kids eat their lunch under the trees by the school. Kangaroos are frequently in the school yard. How neat it is to talk with a friend who is having summer as we are in the midst of winter! 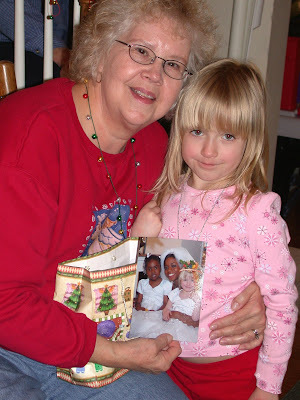 Click on the link below to see the video of Grandma and the grandkids are doing their elf dance. If this interested you, you might try your hand at the programs provided by www.jibjab.com. The Jib Jab folks became famous by doing parodies of politicians such as This Land is Your Land and Bush's Second Term (http://www.jibjab.com/originals/second_term). The link below was produced by the Jib Jab website and features me and my best pal, Dan. You will see that we are actively involved in a snowball fight with our family members! These programs are large - it may take a few minutes to load if you are on a dial-up internet connection. We spent Tuesday traveling once again to Sarah and Jeff’s abode in Bridgeport. I was planning on helping Sarah grade her student’s science fair projects on Wednesday evening and on Thursday morning. We had made plans to stay Tuesday and Wednesday nights with Sarah and Jeff. On Tuesday evening the kids treated us to a special meal at Bon Appetit – Clarksburg newest restaurant. We awoke Wednesday morning with snow falling at a pretty good rate. 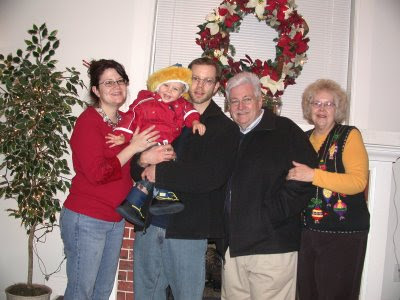 Sarah went on to her work at Fairmont State University - Grandma and I played with Sam. Sam was excited about the Christmas tree. He is really good about not grabbing the lights and RUNNING through the house! Sam donned his WVU Mountaineer hat and thought that it was time to venture out into the snow storm. Wrong! We had to wait until Sarah and Jeff returned from work. Sam once again dressed for the 7+ inches of snow. Sam’s first reaction to the snow was not one of excitement. He stayed in one place wondering why he could not move. I am not worrying – I know he will soon get on to the joys of playing in the snow. Thursday was a great day with the snow over and the sun made the new snowfall sparkle. Everyone went back to work and we finished our shopping chores and returned to the hamlet of Glenville around 7 P.M. Tis another episode in the adventures of Jim and Judy.